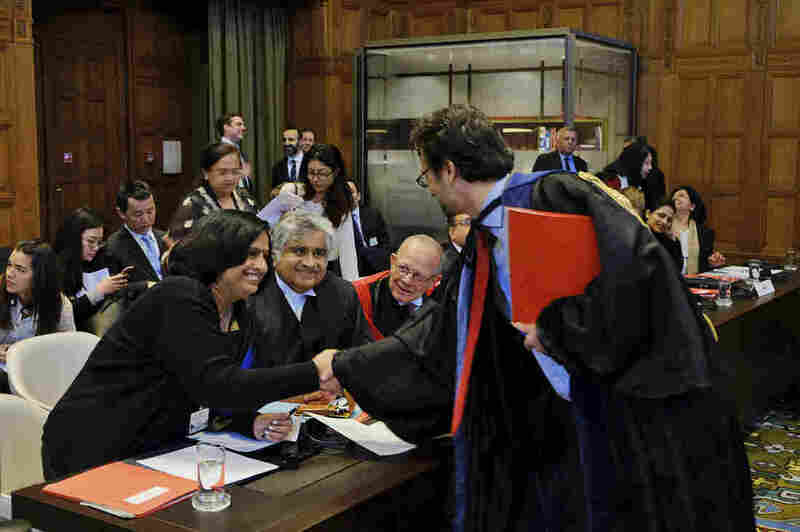 Tiny Marshall Islands Taking On 3 World Nuclear Powers In Court : The Two-Way The archipelago, which was the site of dozens of U.S. nuclear tests in the 1940s and '50s, is suing India, Pakistan and the United Kingdom in the International Court of Justice. A U.S. nuclear test at Bikini Atoll, Marshall Islands, in July 1946. The Marshall Islands is on an unlikely mission — trying to press India, Pakistan and the United Kingdom to curb their nuclear programs. 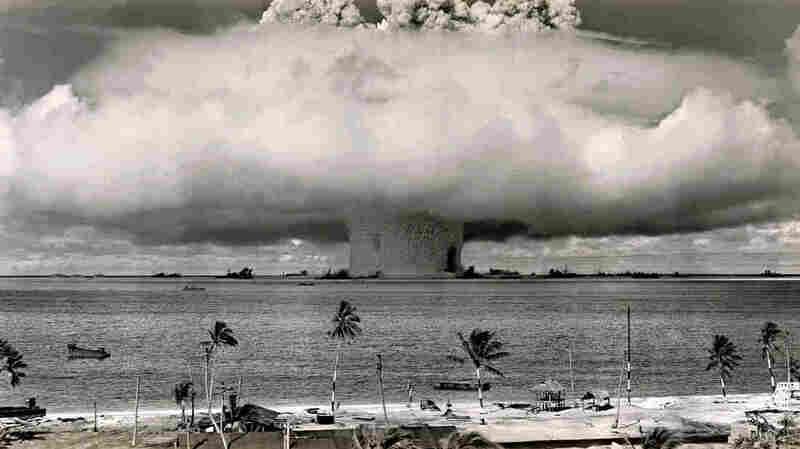 The Pacific archipelago, which was the site of dozens of U.S. nuclear tests in the '40s and '50s, is suing the three countries in the U.N.'s International Court of Justice. The Marshall Islands says the three countries haven't carried out in good faith their obligations to pursue negotiations leading to nuclear disarmament. It says the U.K. is obligated to do so because it is a signatory to the Nuclear Non-Proliferation Treaty. India and Pakistan haven't signed the NPT, but the Marshall Islands argues that this principle is sufficiently well-enshrined in international law to be considered customary law. "Nobody expects the Marshall Islands to force the three powers to disarm, but the archipelago's dogged campaign highlights the growing scope for political minnows to get a hearing through global tribunals," Reuters reports. "In court documents, the Marshall Islands argues that the 1968 NPT, which did not come into force until 1970, amounts to a compact between nuclear haves and have-nots. Non-weapons states essentially agreed not to try to acquire nuclear weapons in exchange for weapons states moving toward disarmament, the Marshalls says." However, only the cases against India, Pakistan and the U.K. are still proceeding. That's because these are the only three countries that have "made a commitment to respond to suits brought at the ICJ," Reuters reports. Preliminary hearings against India started on Monday in The Hague, with sessions on Pakistan and the U.K. scheduled in the coming weeks. The Marshall Islands is pursuing global disarmament as a result of its "particular awareness of the dire consequences of nuclear weapons," according to court documents. "Although islanders were relocated from Bikini and Eniwetok atolls — ground zero for the majority of the tests — three other Marshall atolls underwent emergency evacuations in 1954 after they were unexpectedly exposed to radioactive fallout. The Marshallese say they've suffered serious health issues ever since. "The Marshall Islands were governed by the U.S. until 1979 and won full independence in 1986." The International Court of Justice hasn't issued an opinion on nuclear weapons since 1996. As Dapo Akande, professor of international law at Oxford University, tells Reuters: "The success will be in putting the issue back on the agenda. ... This is as much as the Marshall Islands can hope for." A previous version of this post cited material that referred to the 1958 Non-Proliferation Treaty. While an Irish resolution was introduced in 1958, the NPT was signed in 1968.